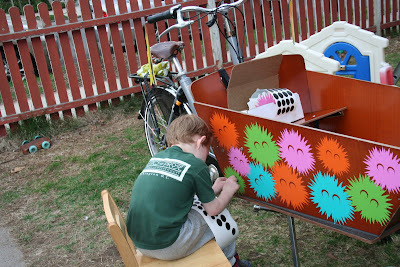 One of the many, many fun things about our cargo bike has been decorating the cargo box. We've made detachable signs for it and then, last summer we discovered that removable wall stickers work incredibly well. You can find a number of fun designs at craft stores or on the web; they are hardy enough to withstand bad weather; when you grow tired of them, you can peel them off and start again. 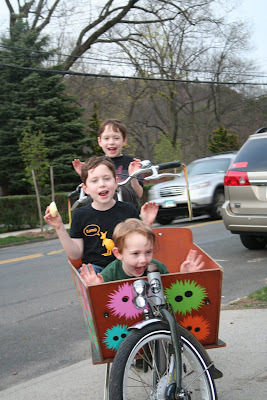 We decorated the box with multi-colored polka dots for the big guys' birthday and then changed to robots on Halloween. The boys have been begging me to change the design for some time, but I held off because I loved the robots from Blik and thought we should get full use out of them. I also kept thinking I wanted to customize stickers, creating text that would read something like, "Stop texting. Keep us all safe." or "A car is not a phone booth." 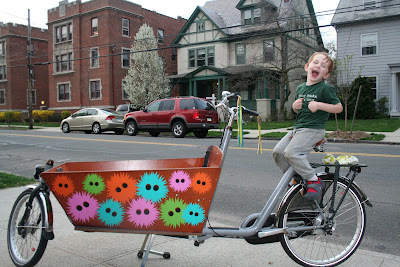 However, the boys didn't seem to like this idea much and P was hesitant as well, worried that we might antagonize some already bike-hating crazy drivers. Instead, a few weeks ago, I got on the web with my four-year-old and we started looking at new wall sticker graphics. Site after site, we couldn't find stickers we could agree on when suddenly I pulled up this one photo and F yelled out, "Sporkies!" Now those of you who don't speak F may not know what this means. Our F, you see, tends to be Suessian with his language at times, randomly creating words that pretty accurately describe what he means. One of his long standing words that the rest of the family has adopted is "sporky." F first used it when he went to kiss his dad after P skipped a morning or two of shaving. "You're sporky!" he called out when he rubbed up against P's whiskers. Sporky was also recently used when I got my hair cut extremely short and came out of the salon with it spiked in all directions. My hair, you see, was all sporky. So when F looked at these stickers and cried "Sporkies!" with delight, I knew we had a winner. 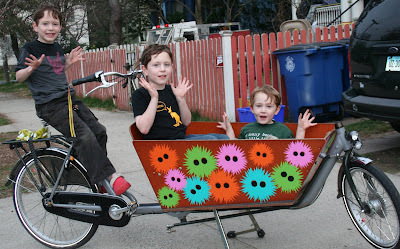 While the company may have called these creatures "Fuzzles," they shall be known in our home-- and in our bike, of course-- as Sporkies. A cool thing about this site was that it had a huge color palatte so F also got to choose the colors he wanted the sporkies to be. 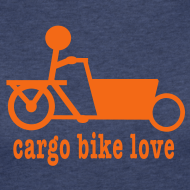 And so now let me unveil our newest cargo box design: multi-colored Sporkies. Since he was the visionary behind the design, F also wanted to be integrally involved in adhering the stickers. The spikes were a bit tricky to get off from the backing without ripping so I took on the Sporkies' bodies, while F became the "eye man." Design completed. One proud four-year-old. No, these are not jazz hands you see. These are three fellas doing their own imitation of Sporkies! Front view. Sporkies all around. Great photos. The boys look so happy! I love this idea! 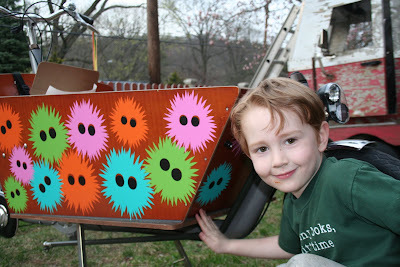 My daughter would love to decorate our bakfiets! Looks great! What a lovely canvas!